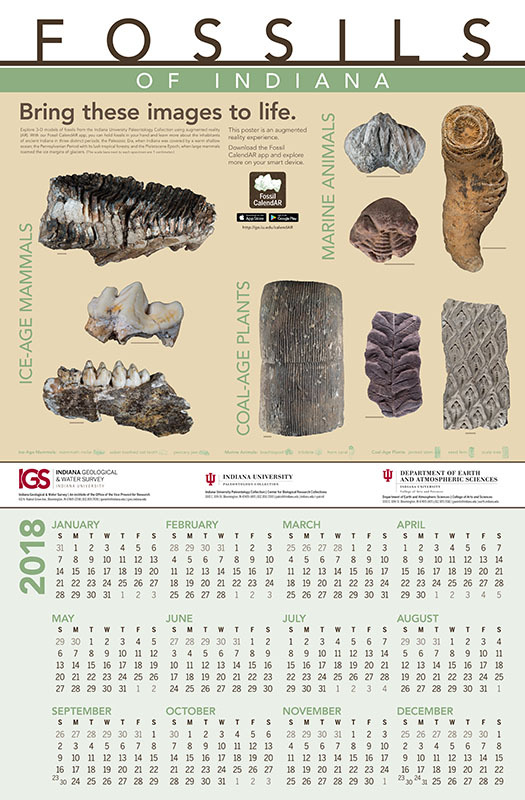 It's not too late to get your copy of the 2018 IGWS Fossil CalendAR with augmented reality and bring interactive content to life on your smart device.You can explore 3-D models of fossils from the Indiana University Paleontology Collection using the Fossil CalendAR app. Augmented reality (AR) is a technology that superimposes digital content onto real-world imagery using a smartphone or tablet. When the camera of the device running the Fossil CalendAR app is pointed at images of common Indiana fossils on the CalendAR, the app recognizes those images and projects interactive 3-D models. The fossils used in the CalendAR were 3-D scanned from real fossils found in Indiana, converted into digital models, and brought to life, digitally, using AR technology. The 21 by 33 inch CalendAR is printed in full color on heavy poster paper and is only $2.00 plus shipping. Or stop by the IGWS Bookstore on the Indiana University Bloomington campus and pick one up to avoid shipping charges. 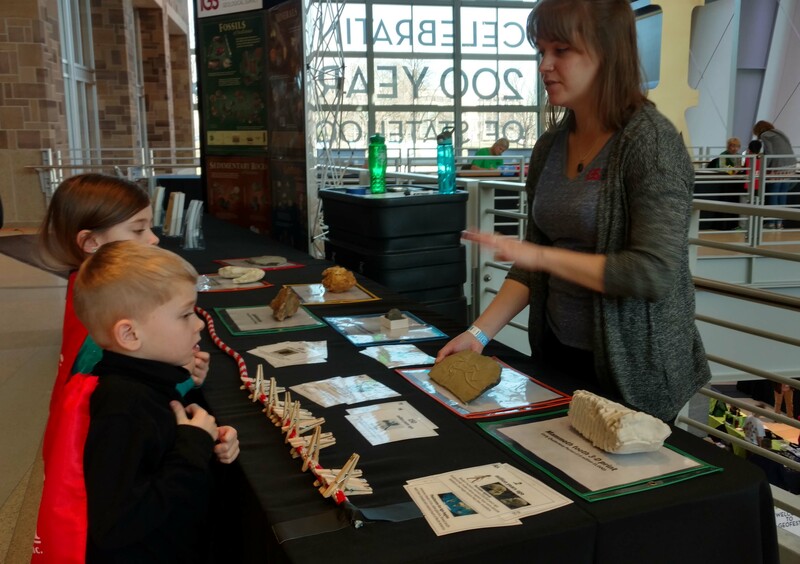 Besides performing research and collecting and preserving data, another important part of the mission of the Indiana Geological and Water Survey is educating the public about geology. In this busy winter season, the IGWS is involved with a number of outreach events, conferences, and courses for the public. Check out the five events below. The 47th Annual HASTI Conference will take place in Indianapolis from Feb. 14-16. 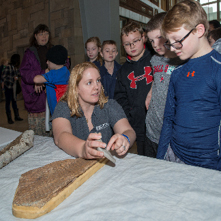 The IGWS will be there with specialized geology lesson plans and demonstrations of the new loanable Discovery Trunks containing materials such as 3-D printed fossils that teachers can sign out and use to teach geology. Annual Celebration of All Things Geology --- GEOFEST! The Indiana State Museum will host its 15th annual fossil, gem, and mineral show GeoFest on Friday and Saturday, Feb. 17 and 18 from 10 a.m. to 5 p.m. and Sunday, Feb. 19 from 11 a.m. to 4 p.m. The event will take place in the museum, located at 650 W. Washington Street in downtown Indianapolis. 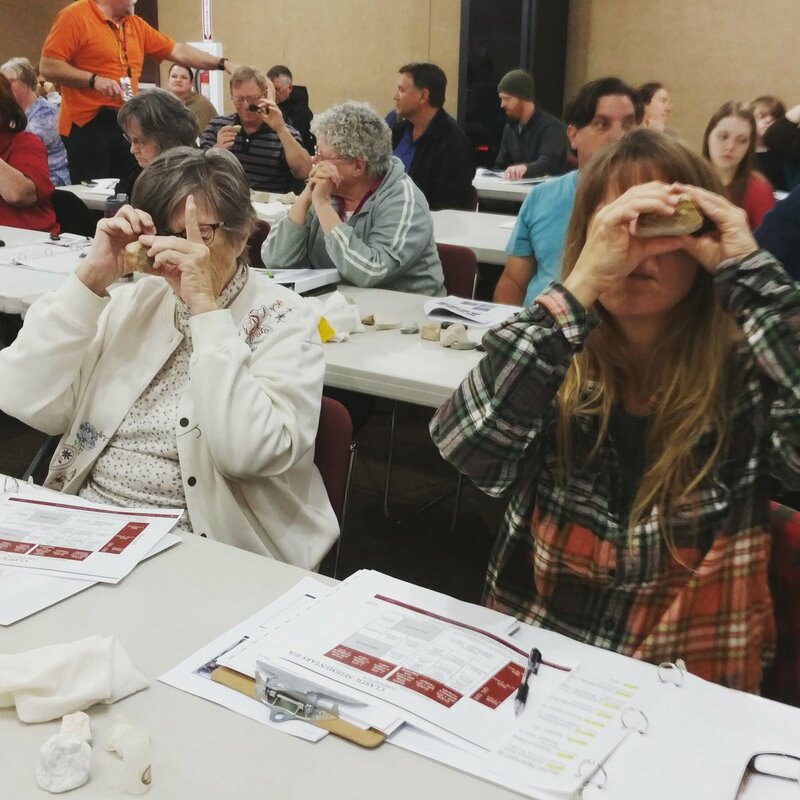 GeoFest will feature geology experts, exhibitors, chances to win geo prizes and hands-on activities that include making your own geode, discovering how rocks and minerals are used in everyday life, building crystalline structures and comparing your speed against ice age animals. Participants will also have the chance to explore the museum's natural history galleries. This conference is designed to heighten girls' interest in scientific careers. The IGWS will provide hands-on workshops for middle school girls from around the state and discuss career opportunities in the geosciences. 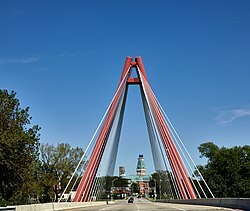 IGWS Director Todd Thompson and Outreach Coordinator Polly Sturgeon will be leading geology courses for the Master Naturalist Program on the sedimentary rocks, fossils, and paleogeography of Indiana: Jan. 23, Monroe County; IU Teaching Preserve, Feb. 23, and Southeastway Park, Indianapolis, April 27. Beginning March 5, the Lawrence County Bicentennial will host a gallery of photographs from the Indiana Limestone Photograph Collection at the Downtown Depot in Bedford. Once the Southern Indiana Railroad Station, this historic building is now used as a tourist and information center. The gallery will highlight the importance of Indiana limestone in Bedford's history and its impact on American architecture, on display March through June for Lawrence County's bicentennial and Indiana Limestone Month (June). A new online interactive map illustrates important reference information about each core in the IGWS bedrock core archive at a glance. These data include the spatial location, IGWS reference number, total depth below the land surface captured by the core, top bedrock unit penetrated and depth to the top of that unit, and bottom bedrock unit penetrated and depth to the bottom of that unit. Most cores in this collection preserve a continuous stratigraphic succession between the bottom and top formations. 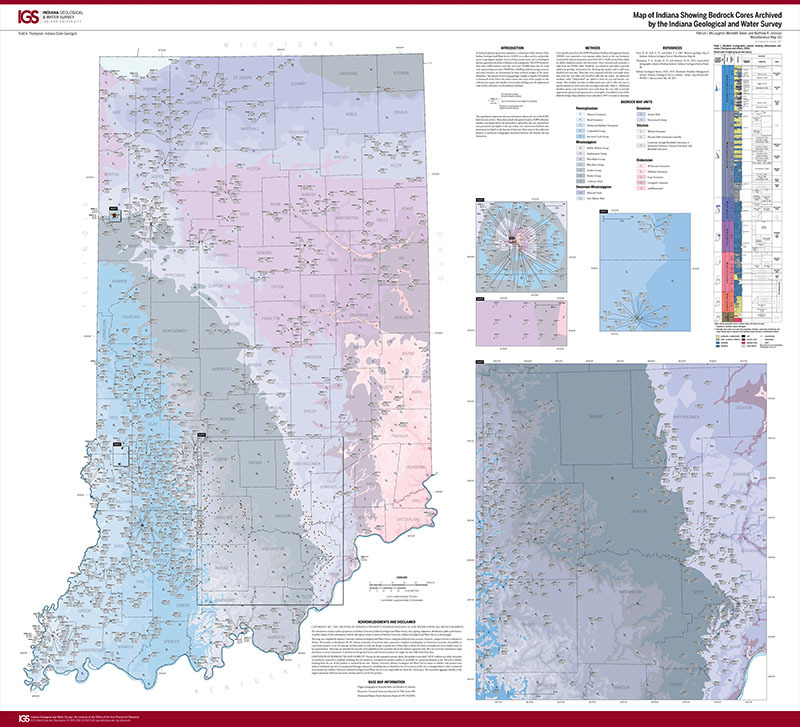 You can also purchase a paper copy of the map from the IGWS Bookstore. 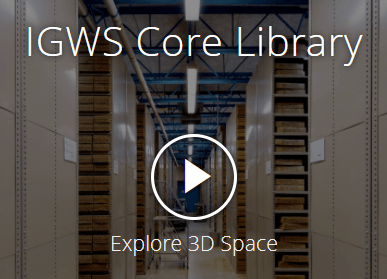 The IGWS recently paired up with the Indiana University Advanced Visualization Lab to create this 3-D tour of the Survey's Core Repository. The Research and Teaching Core Repository was completed in 1976 and houses drilled cores taken from all over Indiana. It has approximately 35,000 boxes of core containing 51 miles of rock and sediments. The facility is open to the public Monday through Friday, 8:30 am to 4:30 pm. This story map presents the bedrock geology of Bartholomew County and emphasizes its economic potential. The site includes a bedrock geologic map of the county plus specialized maps that emphasize resource potential, as well as figures, photographs, descriptions, and tables.